Last week, I decided to hop on the adventure that is the Master Cleanse and just recently completed the ten days. Fasting a couple of times a year works for me, it makes me feel lighter, more refreshed, and reminds me to be appreciative of food and its true purpose – to nourish the body and feed the soul. I like to do it during the warmer months of the year, and this time was a sort of Spring Cleaning. I’ve been on other juice fasts and feasts before, but this was my first time on the Master Cleanse. I found this program to be much more manageable – it did not make me sleepy or drain all my energy like the aforementioned juice fasts often did. That’s likely due to the fact that the cleanse drink consists of two tablespoons of lemon juice, the same amount of grade B maple syrup, and a generous pinch of cayenne pepper, all for a glass of water. Six cups is the minimum for a day. Maple syrup has plenty of sugar and calories, and cayenne pumps up the blood flow, so there are lots of reasons for energy. Ten days later, I feel great, just like new. Now I just need to do the same kind of deep cleaning to my kitchen! While I did not get any hunger pains during this program, I did get plenty of cravings. Cooking is my thing, what I think about all the time, so that was only natural. I found myself in silly daydreams about the first thing I’ll eat after the cleanse, recollecting special culinary memories, composing new recipes, anything and everything food-related kept knocking on my mind’s door. In addition, I had to continue feeding my family, packing lunches for Paloma and keeping it all interesting. 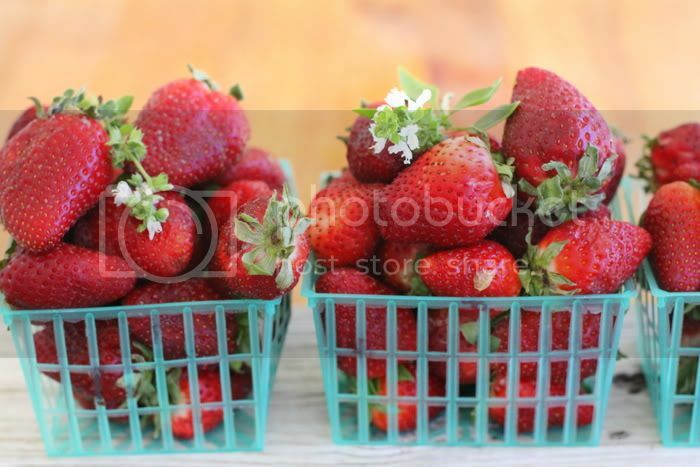 Also, I could not pass by the beautiful local strawberries we’ve been having at our markets. Pretty, plump ones, with vines still attached. That is when I bit my maple syrup-ed lips and started working on this recipe. A strawberry shortcake of sorts. 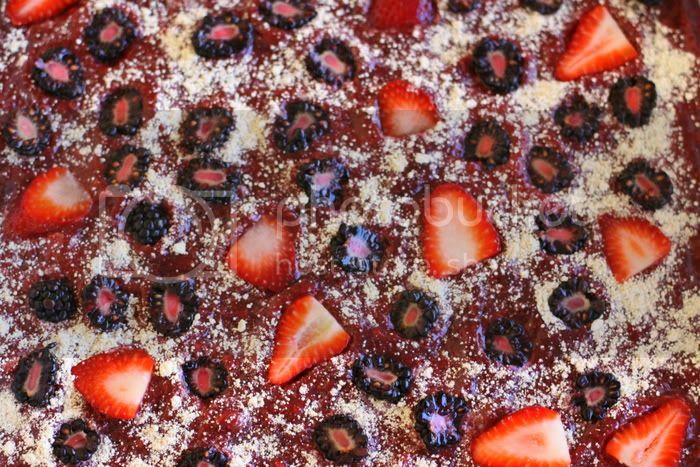 I utilized my favourite oat dough, combining it with strawberry puree to get a moist and fruity crust. I then topped it, simply, with the same puree, raw preserve and sliced fresh berries. After some time in the dehydrator, the dough happily hardened on the outside and stayed nicely moist in the middle. All the while, the topping thickened, concentrated, and turned into a ruby jam. At first, we treated this “shortcake” as dessert and ate it after dinner, appropriately. The surviving cakes, however, became snacks and regulars in Paloma’s lunchbox. Oh that lunchbox, I’m not exaggerating when I say that everything I cook ends up in there, our girl’s appetite is no joke! And even though I am now “easing out” of my cleanse with fresh juices and light meals, I let myself have a slice, and really enjoyed it. I believe there’s enough sweetness here to last us all a while. The next recipe will be a savoury, I promise. 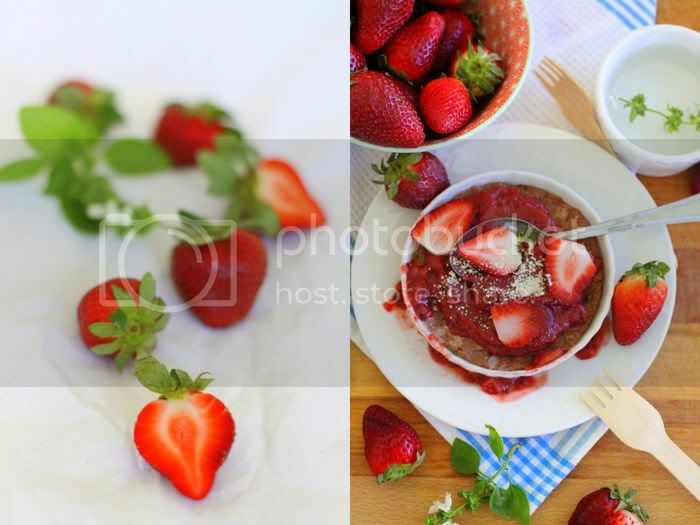 To make the puree, pulse fresh strawberries in a food processor until you end up with a slightly chunky puree. Mix the oat dough with the puree. Divide it between two sheet pans covered with parchment paper (or you can use any smaller individual dishes if you’d like) and press into the pans to achieve a uniform layer. For the top I used a combination of raw strawberry preserve and fresh chunky strawberry puree. The preserve makes the mixture a bit thicker, and less runny, but I believe that you can get away with using just the fresh puree. You can just dehydrate it by itself for a couple of hours to thicken it up more. You can sweeten the puree/preserve mix to your taste with your favourite sweetener, or just leave it as is. I didn’t measure the proportion, or the combined amount. The more berry puree you use, the sweeter and more moist your cakes will be. 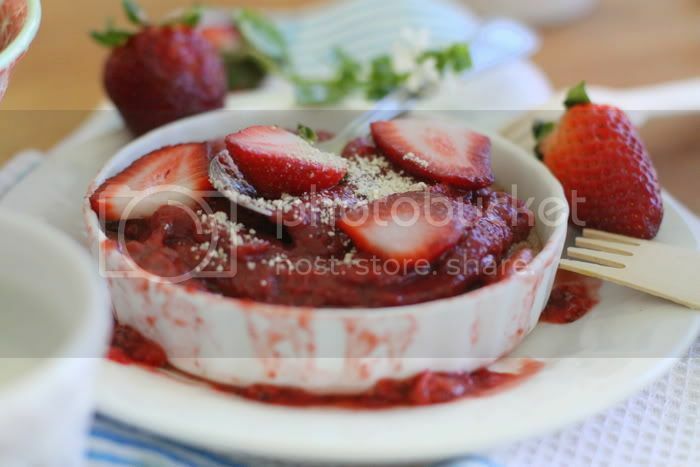 Divide the strawberry puree between the two pans, or other dishes, and spread evenly on top. 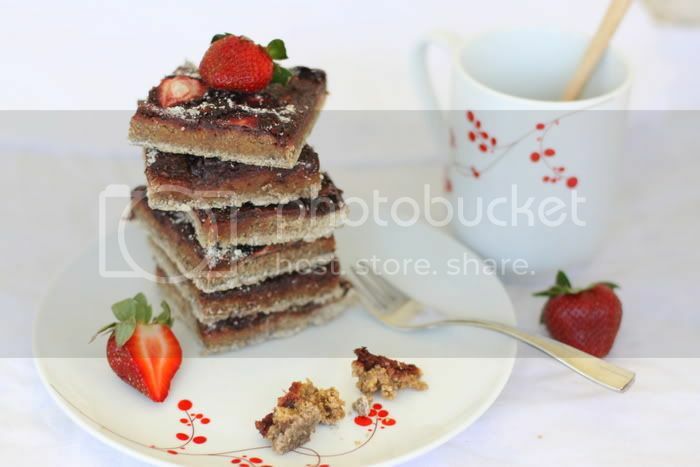 Sprinkle with oat flour or ground nuts and decorate with sliced fresh berries. Dehydrate at 115F for about 20 hours. Remove from pans, peel away the parchment paper, and dehydrate on the mesh screens for another 6 hours or until your cakes are firm enough for you to cut them into desired shapes. Cut or leave as individual cakes, depending on the dishes you are using. After this step, dehydrate for another 2-3 hours or more. The time of dehydration depends on the thickness of your strawberry puree layer. It should be dry to touch, but moist and chewy on the inside. I noticed that these cakes become increasingly tastier after some time in the refrigerator. Usually, they are the best at the end of a batch, when the crust becomes moist and full of the topping flavour throughout. I am looking forward to the arrival of beautiful berries! I’m happy to hear you enjoyed you cleanse. I’ve never done one but often consider it. This recipe is such a fantastic celebration of the season. We’re still a few months out of strawberries – but I know soon I’ll packing this treat in my lunch box too. Thank you. I dont know if I would have the will power to do that, bravo. What a gogeous treat too. You’re blog is really great !!!! This recipe is great,the jam is very versitile. Thanks. ! As delicious as your dishes are, I bet the rest of your family isn’t fasting…especially Paloma! Wonderful recipe and nice new take on an old standard. Fabulous photos as well. Looking forward to the next posting, as always. Just found your blog the other day, HOOKED! Question, how do refrain from eating that whole batch immediately? ;) Beautiful stuff! hello from australia..this cleanse sounds intriguing, i want to try it!! can i do it for less than ten days? strawberry shortcake was a classic dessert :) I am so looking forward to berry season! 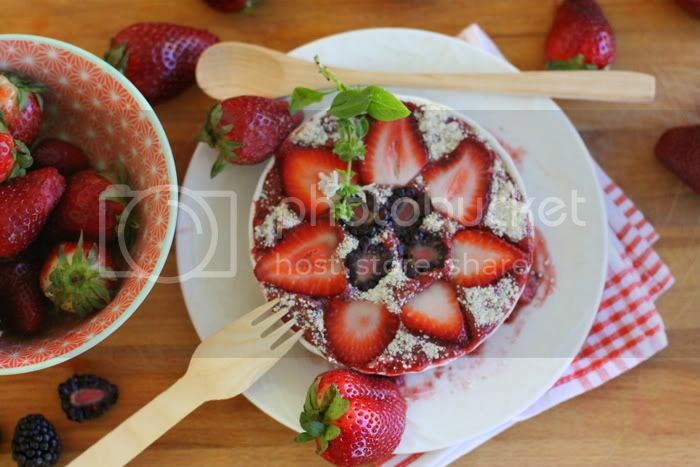 And I will have to try this recipe when I get my hands on some fresh strawberries!! Sean, you are so right, my friend! Silvie, hello! I think it’s thought that ten days is the optimum number for your body to rest from food and “cleanse.” Some people even do it for up to forty days, but that’s crazy talk to me. I would imagine four days would be a good number, but for best results I would stick to the ten. 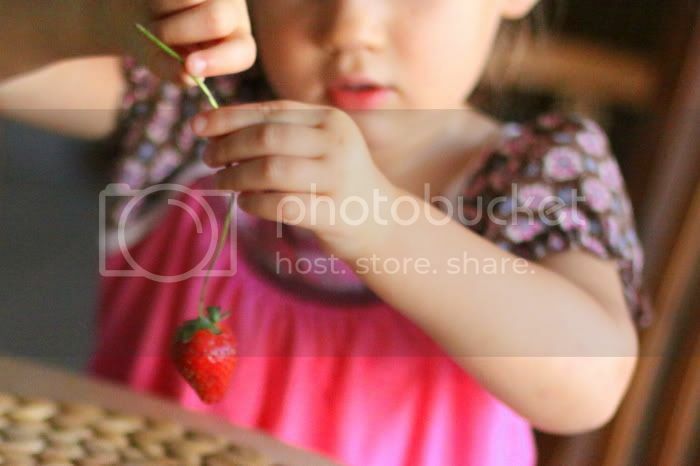 Just found your site through FG, amazing concept and photography. I love Master Cleanse as well. This looks absolutely delicious! Your blog is my favorite now! Congratulations on making it through the master cleanse. I’ve always been intimidated by it, but I can imagine that it gives you renewed appreciation for food. I can’t wait to get my hands on a dehydrator and try your recipes! I love your blog, and recently bought a dehydrator. Want to try one of your recipes with oat flour, but I don’t know where to get maple syrup powder. Can you direct me please? Anonymous, thank you for your comment. You can buy male syrup powder here. Good luck to you! OMG! I just find your blog. Your pictures are amazing! Congratulation! Anja, welcome and thank you! Jenne, so happy to have found your blog as well! Titi and Jodye, thank you! babe, you’re the only person in the world that makes me long for a dehydrator. This looks beautiful. looks amazing and i am sure delicious! I have never done a master cleanse because I am scared, but I hear wonders from so many friends. These strawberry shortcakes look so delicious… so much better than the ones I had as a kid! Just found your blog and OMG, I can’t stop looking through your posts!I never knew that raw food can be so enticing. I have to try it now, do you know any good place in NYC? Neila, thank you so much! We love it when readers are inspired to try raw food. As far as places in NYC go, try One Lucky Duck for delicious smoothies, desserts, snacks and meals. And if you are in the mood for something more fancy, Pure Food and Wine is the way to go. I’ve never been, but I cook from the owner’s cookbooks all the time and have heard nothing but positive feedback from those who’ve eaten there. Oooh this looks divine! I have my dehydrator all set up in the old microwave’s home and this would be a good first dessert to try. Congrats on the cleanse, feels great doesn’t it? I often do the same but only consuming fresh juiced greens for as many days desired. Think it’s my turn to cleanse! Thanx for such inspiring shots, gorgeous! Devine – looks wonderful and is on the very long list of things to make and try from your site and as for the photos – beautiful!!! I am SO SO impressed that you went the full 10 days on the Master Cleanse! You must have iron willpower. I too love cleanses, but I find that when I’m training for races I can’t afford to reduce my calories so drastically for an extended period. Instead I use spectrum cleanses like Mediclear plus that I feel flush the system but still give me energy to study, exercise, etc. After my half in the beginning of June, I’m going to go for it though! Thanks for the inspiration! Gorgeous. I tried the Master Cleanse once, and though I made it all ten days, I’m sorry to say I was groggy and cranky the ENTIRE time, gained all the weight back (and then some) within a month, AND found I had multiple cavities – damn that maple syrup! I’ve wanted to try a juice f(e)ast for some time now, but I fear a similar result. The strawberry shortcake is gorgeous! Kelsey, thank you for your comment! Yes, I imagine training and master cleanse would not make the best pair. I’ve never heard of Mediclear Plus, going to check it out now. Amber, thank you! I think the only reason I was not cranky the whole time is that I do these cleanses pretty regularly, so I am used to them by now. And yes, I brushed my teeth a hundred times a day! Juice feasts are better for your teeth :) but they do make you a bit cranky, even more than the Master Cleanse, in my opinion.